And it is Christmas Eve!! Personally, I am just a tad sad. So this is the last of my mom’s recipes. She only has a handful of recipes, and I’ve already shared three. Maybe next year I will share possibly one of my very favorite things she makes. We only have it once a year and it is amazing. And yes, it is totally all about chocolate and a little booze too. What? Yep, booze in Christmas desserts are a must. I have to say, it was really weird making this before Christmas. It felt totally wrong and I will probably never do it again. Chex mix is a Christmas Eve only thing around here, and you better bet I will be making another double batch today. Just gotta have that smell and something to munch on all night. So, Mom’s recipe is really not a secret, it is just smart. Basically, she added more of the good stuff. You know, the stuff everybody always picks for. The pretzels, bagel chips and nuts. And then the most important thing she upped? The butter and seasonings. Yup, she is pretty smart. Gotta have lots of butter on Christmas. Well, really just lots of everything good on Christmas! Also, Mom has always baked her chex mix in the oven. Seriously, do not try to make this in the microwave. Eww, that is just not good. Go for the oven. Nothing is better than chex mix baking in the oven, the Christmas music + movies going and people just about everywhere! Mom and I in the kitchen, the brothers hanging around eating, the brother’s friend joining them and the cousins telling stories and just plain making thing so much better! 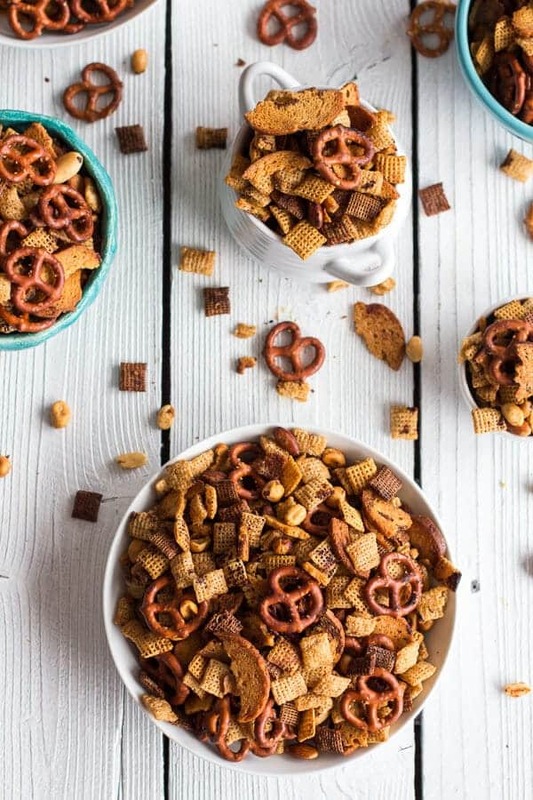 In large bowl, mix the chex cereals, mixed nuts, pretzels and bagel chips. Set aside. Melt the butter in a bowl and mix in the worcestershire sauce, seasoned salt, garlic powder, onion powder and a good pinch of pepper. Pour the butter over the cereal mixture, tossing well for 3-5 minutes or until the cereal mixture is evenly coated. Bake 1 hour, stirring every 15 minutes. Spread on paper towels to cool, about 15 minutes (or just start eating!!). Store in airtight container. Oh, and I almost forgot to announce the winner of the KitchenAid Mixer Giveaway. First, can I just say I was BLOWN AWAY by the incredible comments you guys left. WOW! Pretty much every comment was not about a gift for you, it was about making your family happy, healthy and together for the holidays. I read every single comment and really, you guys that is what Christmas is about. Family, happiness and being together. I am simply in awe of all of you! Ok and the winner is Kortnie Madison-King! Congrats!! Shoot me an email as soon as possible (like by Thursday night)! Merry Christmas Tieghan – thanks for sharing your recipes. 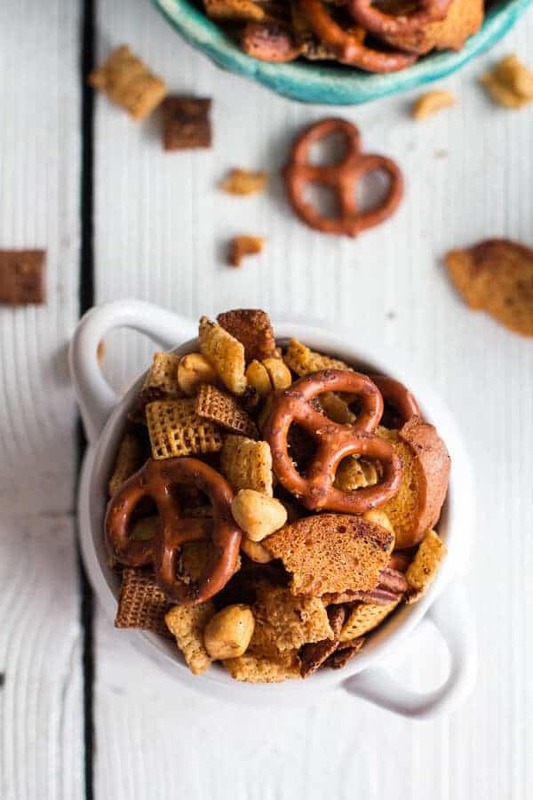 This Chex Mix will soon be made at our home – too late to make today/tonight but for sure New Years! Hope you and your family have a fun filled Christmas. Thank you, Judith! Merry Christmas! Thanks Taylor! Merry Christmas to you as well! I hope you have a great one! Oh goodness – your Mum’s recipes are amazing. So decadent and so more-ish! This looks so good!! Wishing you a very Merry Christmas to your and your family Tieghan! 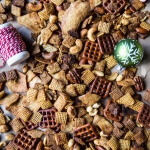 I need to hop on the holiday chex mix tradition! This stuff looks like lots of fun to snack on while hanging with the family tonight. It’s probably amazing at absorbing booze…not that I’m drinking booze this evening or anything… 😉 Happy Xmas eve!! Thanks Julia! Hope you had a great Christmas! You’re mom must be so proud to take over this little space for a few days! 🙂 Her recipes are so foolproof–I could definitely use more of those in my life. I tend to over complicated things, if you know what I mean. Merry Christmas Tieghan!! Hope you have a relaxing (and work free) day to relax with your family. And enjoy the new house 🙂 No stress allowed, haha. YOUR mom. Sorry, major typos going on today. I do that same thing. Over complicate everything. It killed not to mess with these recipes! LOL! Thanks Laura! Hope you had a great Christmas! Thank you! Chex mix is my favorite! Oh I love the idea of 60 days in December! Christmas really does need 2 months of celebrating! I love homemade chez mix – it is so good! Your mom’s version sounds delicious. Thanks for sharing it with us! This looks SO good and reminds me of making chez mix with my grandparents when I was a kid. We always added extra butter and spices, too! Thank you, Kristin! And I hope you had a great Christmas! Merry Christmas Tieghan! This mix sounds delicious! And so does your Monkey bread you posted yesterday (I think!) I’ve never cooked a mix like this in the oven, I bet it makes it nice and crispy/crunchy! 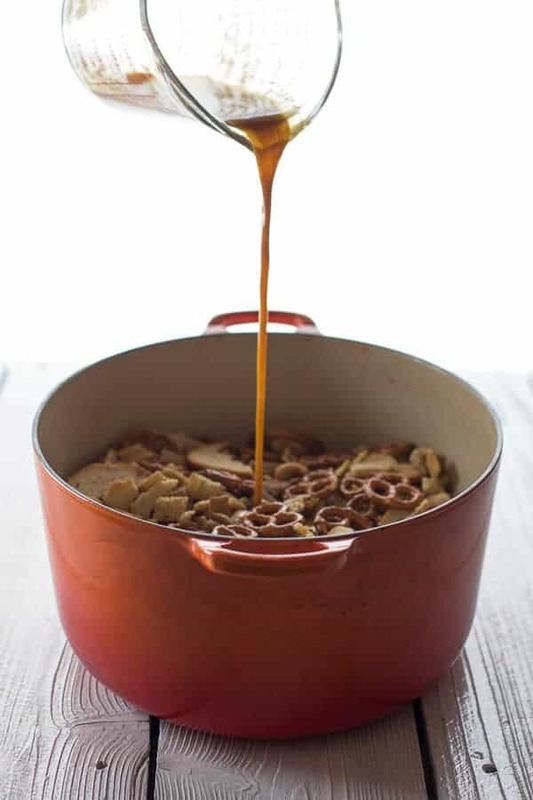 It’s New Year Day mix in my family–my mother always made a lovely batch, and we would eat it while watching the Rose Parade (and Rose Bowl), so Chex Mix has good associations for me, also! This looks like a good one (a couple years ago, I rounded up a variety of recipes, but I think classic is best). Going to print this, and think I better add you to my blog feed! 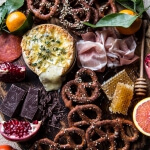 Hope you love this recipe and thanks for adding me to your feed! Thanks for sharing your mom’s secret recipe! 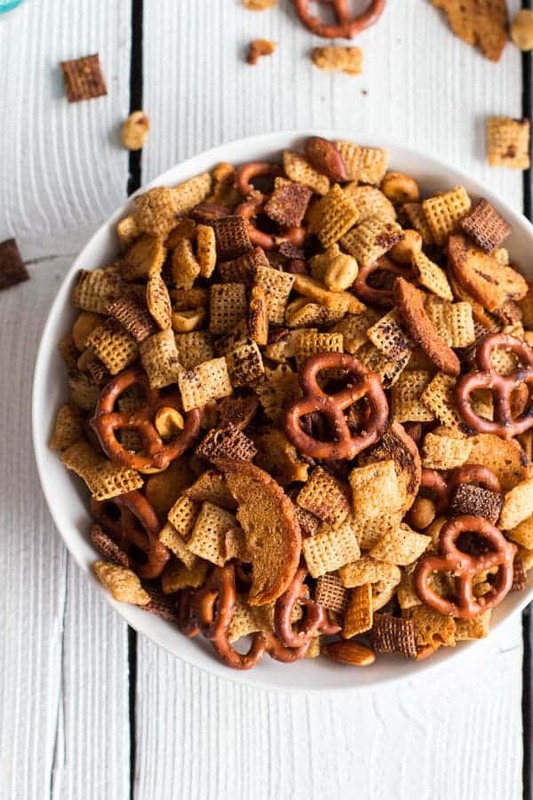 I will be trying this chex mix recipe for new years. The bagel chips are my favorite part of Chex Mix so I just love this. Wish I was snacking on some right now! Question – Do you bake it in the bowl or spread it out on a baking sheet? Thanks! Spread it out on a cookie sheet. Hope you love this! Original Chex Mix recipe calls for 6 Tablespoons butter. So sorry you had trouble Krissy!! I was so looking forward to this! Unfortunately there was sooooooo much butter that it all turned out soggy. Why so much butter!? Honestly, my fault for not halving it when I saw it. The rest is great I would suggest half of what is called for with the butter at the very most. I now will start all over with the leftover cereal. I am so sorry the first batch turned out too soggy for you! I hope the next one turns out great! Thank you! Just made this in time to watch Super Bowl 49. The recipe is perfect as written. Thank you for posting this recipe. when I make my chex mix I add cashews,and cheese fishys, and it turns out great. I’m so glad I found this recipe. This was a holiday staple in my home as a child and never really knew how my mom made it. All I know is that I loved it. Will be making this as a weekend snack for movies as well as the holidays! this write-up verry pressured me to try and do so! Yoour writing taste has been amazed me. Thanks, very nice post. Tieghan – I see that this string is almost two years old but I just came across the recipe today (June, 2015). The recipe looks delicious – I love the idea of adding more of the good stuff. I am anxious to try it to bring to the cottage for our family vacation. One thing, though…I was surprised no one has let you know that in your instructions it says 2 1/1 sticks of butter (instead of 2 1/2) and there is no mention of adding the Worcestershire sauce. Just thought you might like to know. Thx. Thanks for letting me know about those mistakes, I will fix them. Also, I hope you all love the chex mix! Tieghan, your mom’s secret recipe has become a family favorite .. soon to be a tradition! 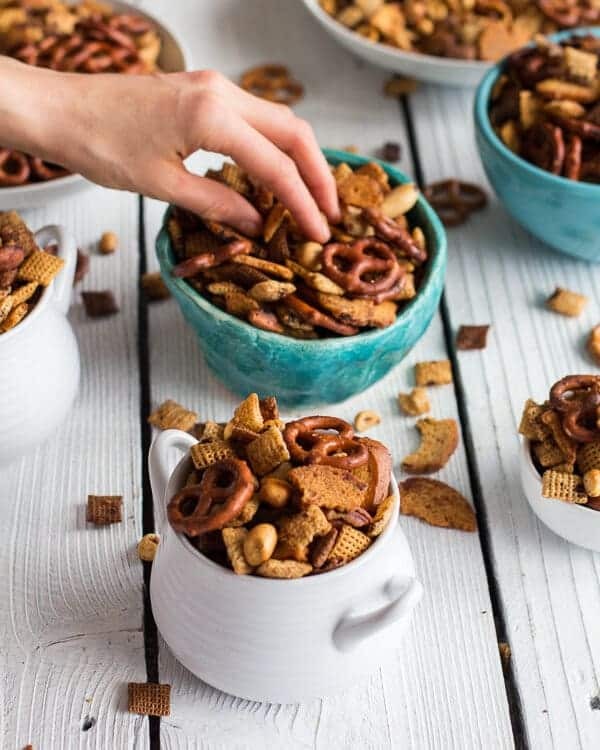 I’ve baked this chex mix numerous times over the past year (I know, a sacrilege from your Christmas Eve tradition) because family and friends keep asking me to bring a bowl! Yesterday it was on my Thanksgiving tasting table and because of the ratio, people take spoonfuls rather than ‘picking through’ the mix. Hazelnuts, almonds, and Planter’s honey roasted peanuts are my favorite ‘mixed nuts’. Best to your mom! SO happy you are loving this recipe, thank you!! Love your mixed nuts combo!! Happy (belated) Thanksgiving! 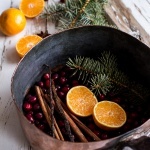 late to the party but looking at this for a large gathering this weekend…do you know how long this would stay fresh in an airtight container? I want to bake ahead of time but don’t want to sacrifice the awesomeness. thanks! Hi!! I think this is best within two days of making. Hope you love the recipe! Oh, and by the way, store it in Ziplocs and it lasts a long time. It’s never stale before we run out. I make mine the same way. More butter, more seasoning, and more of the good stuff. Grandmothers know best! I just made this and had my doubts that it would get crispy. However, being more patient, I let it bake for the suggested time and it is crispy, buttery and WONDERFUL! Thanks for this great snack recipe. It’s funny, because pretzels are considered the not-so-good stuff at my house… They never seem to soak up enough flavor! Otherwise, your mom and I have the same secret recipe! I always double (or even triple!) the butter and spices! It’s so bland if you follow the recipe. This one is a Christmas tradition around my family get-togethers too! Ah, the pretzels are A must in our family! So funny we have similar tradition! This recipe looks amazing. I’ve read through the comments and I am going to print this one off 🙂 I am going to make some chex mix for my Gilmore Girls revival watching next weekend 🙂 and some to bring to work. So can’t wait !!! and bagel chips????? This is pure genius. Ah that sounds so perfect! I hope you and your friends love this one Anj! Thank you! I am SO glad I found this recipe! I went searching and the one on the Chex site said mix in the microwave and all I could think was ‘If I did that my grandmother would roll in her grave’! I get that all these companies think we want “quick-n-easy”…..but the holidays are NOT about that! The time it takes to make this is what makes it so good!! I cannot wait to share this with my 3 sons, it will be to first time they’ve had it and I hope to make it a tradition of ours, like it was for me when I was young! Thank you!!!! Hi Kevin!! SO happy you made this Chex mix!! Its seriously my family’s favorite too!! So happy you loved it and I hope your kids do too!! Thanks so much!! My uncle used to make Chex mix every year during the holidays so when I saw a packet of “Free, take one!” seasoning mix at the grocery store, I grabbed it! It’s in the oven right now and I knew before even putting it in there that it wasn’t going to be what I remembered. So off to the interwebz I went and found your recipe. Guess what’s going on the oven next?!? I knew that packet recipe didn’t have enough butter… or seasoning! Thank you for posting (3 years ago!) and Happy Thanksgiving!! YES!! Such an old recipe!! But still one of my favorites!! So happy you liked it!! Hope your home is filled with love and Jesus this Holiday Season! Thanks!! Hope you had an amazing Thanksgiving! did you ever post the chocolate alcohol recipe of your mom’s that she makes once a year?!!?! HI Margaret! I am sorry, I have not posted that. Maybe later this month, but I might hold onto her recipe for a bit. If you want to email me I can send it to you! Nossa que prato diferente, adorei, vou fazer no Natal. Making Christmas gifts ,putting into containers with a bow.I give these to my neighbors and my mailman.Already wrote down ingredients for grocery tomorrow. Thanks somuch and Merry Christmas and a Happy New Year! That is so thoughtful of you to do! I may just have to start that!! Thank you Salley! We also put Cheerios in our mix. Great stuff! Frustrated with this recipe…used less butter, (because I don’t want soggy chex mix) and your temperature for baking? Way off! I had to stir mine after 5 minutes of baking and it was already burning! I’ve turned down my oven now to 200°, but I think this batch is too late to fix. Wasted food & money ? I was frustrated too. I even added some buffalo wing sauce and it was still bland and flavorless. If I make it again I will use less butter and double the seasonings. Hey Lynette, I am really sorry this recipe is not for you. My family truly loves it, but again. I am sorry it did not work out for you. Lynette, you may be leaving out the most crucial step in this process. COOLING on a blanket of paper towels! The chex retain their heat, and any left over moisture evaporates, the flavor dries to the Chex, and Voila!! I did however lower the about of butter I used to 2 sticks, increased my worcester by 1-2 TBLS (because I love it) and rounded the seasonings up to whole numbers just to remember it easier! In my opinion the point of looking for recipes like this is to try them and use them as a base for your own taste. I made this once exactly as instructed, then the second time I tweaked it a little bit and made it my own. The original post is a great platform. Having said all that, this is the perfect foundation for ANY chex mix, what you do with it from here is ALLLLLL up to you and your tastebuds!! Thanks for everything you said here Kevin! All sounds great to me!! So sorry it was too much butter ): Hope you still enjoyed!! Mine came out burnt, unfortunately, but I’m going to try again and just cook either on a lower temp or less time because, otherwise, it came out great! So sorry it burned! Hopefully it works better next time! If you double the recipe, does your cooking time increase? No, but you will need to use 3-4 pans. It is important not to over crowd the pans. Let me know if you have other questions. Hope you love this and Merry Christmas! I tripled the recipe, baked it all in one pan (I used my big silver roasting pan) and let it cool in the same pan. It worked out perfect. I ended up making a 2nd batch because people loved it so much. The cereal combo I used was shreddies, cheerios and chex. Tasted great !!! SO happy that you liked it! Thanks Anj! Great recipe. I have to tell you, I have used the microwave for the last few years and it is so much faster and easier; and absolutely no sacrifice in quality! Everybody loves it! Great recipe!! !~~~not crazy about pretzels tho so left them out. Used lots of thick garlic toast from the deli section broken up and added some honey nut chex. Made batches of it and gave away at Christmas. My shopping cart was full. Fun day at mom’s. Wasn’t quite sure about the amount of butter but used all of it in recipe and it was super great!! Honey nut chex was a nice addition. I loved the sweet crunchy taste. Thanks Cindy! Leaving the pretzels out is no biggie! Sounds like an amazing day! Couldn’t be happier that you liked it! Horrible recipe!!! DO NOT USE 2 STICKS OF BUTTER FOR CHEX MIX! Melt the butter & drink it instead! Seriously, most recipes call for 6 tablespoons of butter. Try another one! So adjust the recipe to suit your needs. Geez calling it horrible is uncalled for. Hi, so sorry you did not enjoy this. I hope you enjoy other recipes, though! Thanks for trying it! Hi, I tried this recipe but there was waaay too much butter. The cereal wouldn’t crisp properly and everything was very oily. If you make this recipe I suggest you halve the butter called for. Hi Courtney! So sorry this did not turn out too great for you. I hope you make this again, with half the butter and love it. Thanks! Thanks for saying how much butter 1 stick is. I have been in England 30 years and cannot remember what a stick of butter is in real terms! I have been making a version (lateral thinking from something my mom sent that is Not the real stuff she used to make) from what I get here and always up the butter because it doesn’t seem enough. So, thank you for confirmation. No Chex except wheat, unless you go to a posh store somewhere. So, I use the store brand wheat Shreddies or whatever they chose to call them. Very good because they are thick. and I put in honey nut loops (store brand honey Cheerios) because I usually can’t find pretzels. The kind I grew up with had pretzels, not bagels. So, anyway…up the nuts and with those two cereals still pretty good. Just came on here to remind myself how much the original called for in things as I can’t find the recipe mom sent that was new-fangled. I have two small children with autism it is very hard to find things they like! We don’t buy chips, but since they are still on the WIC program we get so much cereal we don’t know what to do with! They like store bought Chex mix and so tonight at midnight I’ve prepped 3 batches of your moms recipe and hope to have some snack bags for diaper bag and car ready to go! Thanks! 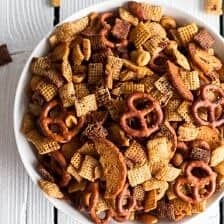 I read through most of the comments and am excited to try a batch of this as my family has been on a Chex mix kick lately. However, I do have a question regarding the salt/sodium. I have a major salt sensitivity and wonder how salty this turns out with this mix of season salt and worchesshire sauce. Do you have an idea on how to adjust the seasonings without it coming out bland? I like cooking and trying new recipes but I admit I’m timid about experimenting (I’ve had some MAJOR fails over the years) if not given explicit instructions to follow. Any help would be much appreciated. Thanks for posting this recipe! Hey Lisa! I would reduce the amount of seasoned salt to 1 or 1 1/2 teaspoons. You can always add more salt if you feel it is needed. Hope this helps and let me know if you have other questions. Enjoy! In looking for a good chex recipe. After a few failed attempts, I’m trying this! You had me at “adding more butter & seasonings” 😉 I do have a question tho, do you bake it in your Dutch oven? Made this last night and oh.my.goodness! It’s so good. I bookmarked it & no longer need to try for the perfect check. I followed the directions just as you stated and I have no idea why some say it turned out soggy. Mine actually burnt a teeny bit but that’s how we like it. Thank you so much!!!!! I am so glad this turned out amazing for you Amy! Thank you! I’m confused as to how much butter. 2 cups or 2 sticks? Perfect seasonings. Thank you for sharing your moms recipe- I love the taste. I am so glad you like this! Thank you Susan! 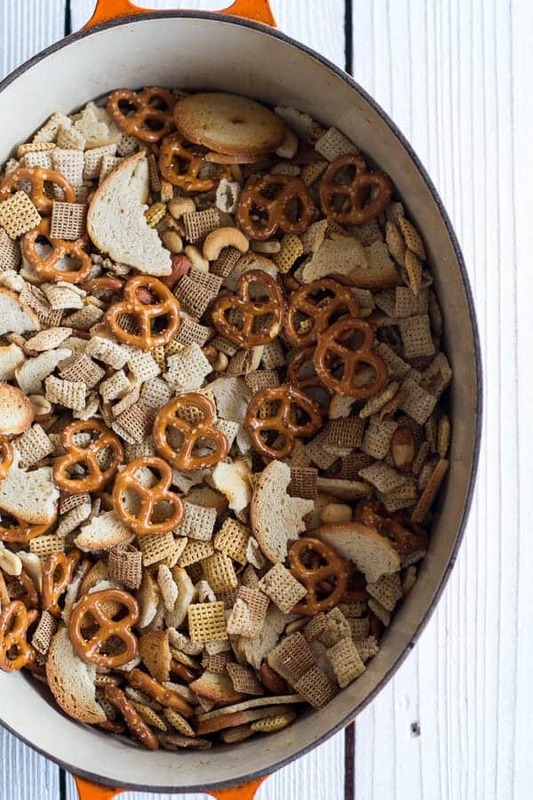 My grandma always made her famous Chex mix around the holidays and this is pretty close to it! It’s bascially the same recipe on the side of the Chex cereal box, but more of the “extra” good stuff as she always said. The people who are complaining about too much butter are the people that don’t treat themselves once and a while. Of course it’s bad for you but there is a reason this is only made around Thanksgiving and Christmas! If it’s too soggy for you then just leave it in the oven for a while longer. Super super delicious and I thank you for this recipe! I am so glad you love this recipe Lindsey! It is a great treat! Thank you! My Brother Died Nov 17th I the only one left in my family ! I miss Christmas at my Parents Home with my Family so much ? So meny things my mother made ( from scratch ) for us ! Thanks for your Mother’s recipes ! That is the exact recipe my mom used. She added 4 tablespoons of Tabasco. Gives it just enough kick in the background. That is so great! Thank you Russ! Thank you for sharing your mom’s recipe. Mom’s are super special. Thank you! I hope you enjoy this recipe Laura! 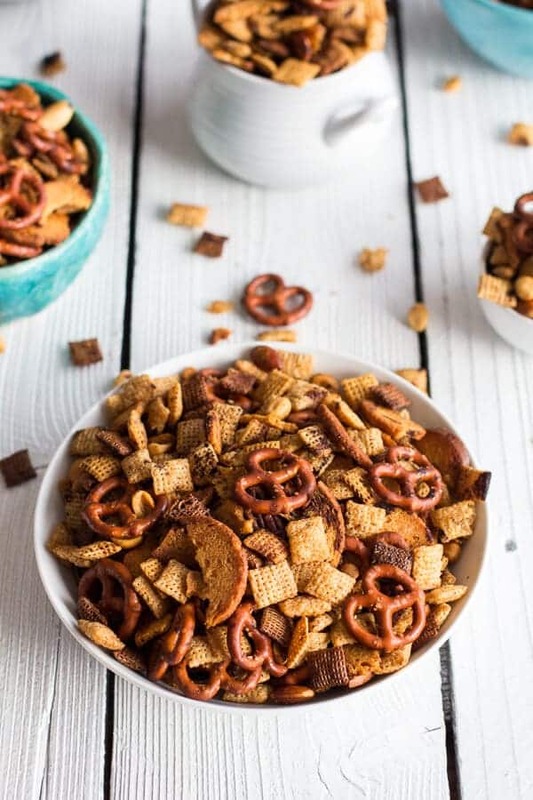 I love homemade Chex mix and definitely want to try this version! Do you put the Chex mix on a sheet pan into the oven or use a Dutch oven like pictured? HI! I use anywhere from 1 1/2 to 2 sticks butter. SO sorry for the confusion. I am making this recipe again tonight, and as I come back to the web page I see your comment. I used two half sticks of butter (1 cup total) previously, and will again tonight. Hope you made it and it turns out amazing! I’m very confused… Your ingredients say 1 1/2 sticks of butter but your instructions say 2 1/2 so I’m honestly not sure which to use since people are complaining about too much butter? In the oven now. Used 1 1/2 sticks of butter (one of your comments states that you corrected your ingredients to read 2 sticks). Melted the butter in the roasting pan in the oven then added all ingredients to it. Stirred and back in it went. Is cooking perfectly…not burning and not soaking. Smells DELICIOUS in here! Glad to have found your sight. Merry Christmas! I hope you love these Michele! Thank you! Comments are saying how simple this version is when you are using 3 containers! I just melt my butter on the stove top in my deep roasting pan, add seasonings, give it a stir & add my cereals, subbing some Cheerios & broken pretzel sticks for some of the cereal, add nuts & broken bagel chips. Mix them all up well & throw it in the oven. Only one pan to wash & I NEVER cool it on paper towels & waste all that goodness! Much easier & tastier! Sounds like another great way to make it! Thanks Annie! I’m a big fan of Chex mix and to simplify even more I bought 3 huge bags of the premade stuff at Costco recently for pennies on the dollar! Sooo, I went to the web searching for more, the sauce with the mostest..butter and spices and worcester, oh my! Your’s was the pick of choice. I added pastachios and Almonds to the pre-mix, and Voila! cheaper and better and done! Delicious! Thank you. Sounds amazing Tonia! Thank you so much! Hi, Did you use salted pretzels and salted mixed nuts? I also used salted butter instead of unsalted, positioned my oven racks in the top two shelves, and when I took them out to stir every 15 minutes I swapped oven positions of the sheet pans so they cooked evenly. All in all, this was a DELICOUS, super easy recipe I can’t wait to use again!! This recipe is right on!!! Perfect amount of spices that make the mix unbelievably delicious! 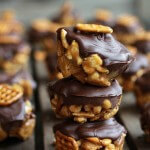 Thanks for sharing….now onto the Snickerdoodle Peanut Butter Chocolate Chex mix recipe!! Thank you so much Connie! I am so glad this turned out perfectly for you! Delicious!! I made this yesterday as a test before our family gathers for Thanksgiving…My husband and I cannot put it down! I can’t wait to share with the fam! This will certainly become a holiday tradition for us! I am so happy to hear that Anne! Thank you so much! Thank you so much, this is the exact same recipe my Mom used to make. I lost my Mom a few years ago along with this recipe. It was always so good! .Thanks again and Merry Christmas Tieghan! I am so sorry to hear that, Amy. Merry Christmas to you as well. I am so glad this recipe reminds you of your Mother’s, that is so special! CHEX MIX IS A HOLIDAY TRADITION IN MYHOUSE TOO, LOVE IT! MY RECIPE IS VERY SIMILAR TO YOUR, EXCEPT I ADD ABOUT 2 TABLESPOONS OF FRESH LEMON JUICE. IT’S REALLY GOOD! Sounds so good! Chex mix is the best around the holidays! Dumb Question…do you bake this right in the bowl or do you spread it on a baking sheet to bake? Hi Sheri! You will need to put this on a baking sheet for it to cook evenly! I hope you love this! Delicious! My first attempt at Chex mix! Turned out great. Thank you for sharing! I am so glad this turned out so well! About to make your mom’s secret christmas eve chex mix. In the pics…it looks as though you tore up pieces of bread instead of bagel chips. Let me know what kind of bread and how much you used. Thanks SO much! Hello… what is seasoned salt? thank you! Hi Patricia! It is salt with seasoning in it! I will leave a link below so you can see what it looks like! I love this recipe because of the simplicity of processing and the available ingredients, which are easy to find. Thank you for sharing this recipe!